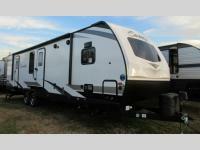 This Surveyor Luxury travel trailer is perfect for extended stay campers who enjoy spending a longer camping season away! This unit not only features a unique front kitchen layout, but both a residential refrigerator and free standing dinette make it feel a lot like home. The dual entry doors allow you easy access to the rear private master bedroom which features a king bed that slides out. Here you will find a super storage center beneath the bed for added space for your things besides the large closet just inside the door. You will also appreciate the dual entry bath with access from within the bedroom, especially at night. 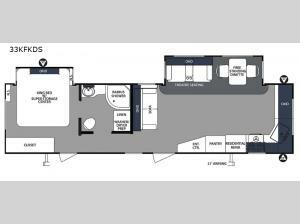 It even includes a space that has been prepped for an optional washer/dryer if you choose to add the appliances.